As e-commerce shifts from a desktop to a mobile-first world, the leading mobile commerce services are increasingly developer-driven companies like Amazon, Uber, Airbnb, OpenTable and Ticketmaster. These companies look to generate sales from new and existing customers in novel ways. Their tactics have diverged from those of traditional e-commerce towards efforts that match their developer DNA. Historically, traditional e-commerce companies have used desktop search, display, brand and affiliate redirect ads to generate new sales through a “pull” model of paid advertising. Pull advertising is premised on capturing eyeballs and attention, converting them into clicks and directing these clicks to ad landing pages. An increase in ad-blocking to counteract poor mobile ad quality has led to a decrease in effectiveness of the traditional pull advertising model in mobile commerce. Thankfully, an enhanced marketing model is emerging in the mobile-first world. Rather than focusing primarily on pull-advertising based tactics, today’s leading mobile commerce services build marketing directly into their products via APIs. Powerful APIs allow a company to “push” the core elements of their services into new, complementary environments. These APIs drive powerful mobile app experiences which have been proven to deliver better commerce results, converting at 3 times the rate of the mobile web, largely due to optimized browsing and payment flows. In this new mobile app and API-based world, a commerce service’s inventory — retail goods, rides, rooms, dinner reservations, tickets, food or groceries — can be pushed to a consumer at the precise moment of relevance and purchase intent in an experience called contextual commerce. A leading example of API-based contextual commerce is Uber’s developer program, which allows customers to view ride inventory — car class, estimated price, arrival time — and book in complementary apps, including Foursquare, United, TripAdvisor and many other services. Uber’s powerful API program pushes the power of Uber’s ride service into the hands of users wherever they are. Similarly, Postmates’ powerful API has led to explosive delivery growth, in part enabled via deep partnerships with retailers such as Starbucks, Walgreens and Chipotle. APIs are the first step in unleashing the power of mobile commerce services, and every company should make theirs available externally to aid in growth and engagement. Yet, while the new breed of mobile commerce APIs are more powerful than pull advertising, they are still a step short of unleashing the true power of these fantastic services in a scalable way. APIs work exceptionally well for 1:1 connections, a la Uber and United, but they require a large BD team, custom integrations and ongoing maintenance to scale to dozens or hundreds of partners. Mobile users spend 88% of their time in apps as of June 2015, and mobile commerce services must connect with hundreds of them in a push vs pull manner. 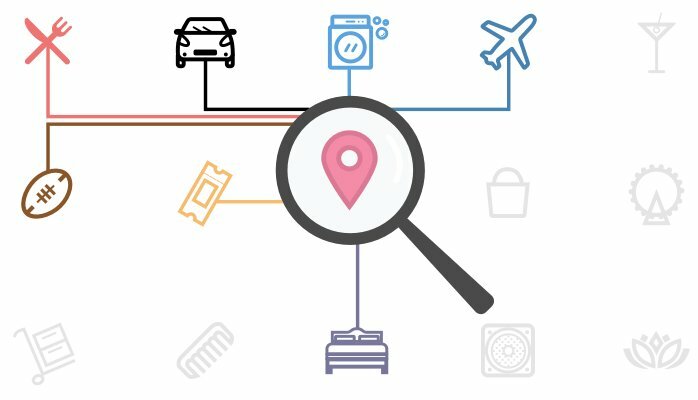 Given that APIs require 1:1 connections, the next step in the evolution of mobile commerce is to render the robust infrastructure of these commerce services as “buttons.” Buttons represent an abstraction of the most powerful and relevant API elements into a lightweight, yet robust package. Buttons allow Uber or Airbnb or OpenTable’s entire service to be easily pushed into a large consumer mobile app with just a few lines of code. And rather than 1:1 integrations, a mobile publisher can grab multiple buttons at once — think Uber + Airbnb + OpenTable + Ticketmaster + Amazon — in one quick and easy integration. These collective buttons in a publisher app instantaneously build a contextual commerce ecosystem that is even more powerful than a collection of mobile ad placements. Whereas tapping on a mobile ad pulls a user into a multi-step service awareness and purchase funnel, tapping on a mobile button brings the user directly into the commerce service utilizing powerful underlying APIs. Mobile commerce apps which “are increasingly becoming thin wrappers around use cases” can now push their core capabilities out to users directly in search, social and discovery environments. The resulting app connections lead to improved user experiences for both the apps where people spend time and the apps where people spend money. Both companies benefit, and a massive user experience roadblock is removed for customers. No longer must a commerce service hire business development executives to negotiate custom, one-off agreements with partners. No longer must mobile apps with large audiences do custom one-off integrations with every commerce provider they would like to connect to. And no longer must developers build, maintain, monitor, manage and optimize multiple third party commerce relationships. Now is the time for mobile commerce providers to push their services to users via powerful APIs rendered as easy-to-use buttons in third party apps. And now is the time for mobile app publishers to provide a contextual commerce experience to their users that is far more friendly and powerful than a mobile advertising experience.